This rich, lovely cake is inspired by Ilva's gluten-free Almond and Ricotta Cake. This cake is one of the most exciting things I've baked this year. I really loved how it turned out. I packed up slices of it to take with me on my trip this weekend and it satisfied my sweet tooth while the folks around me snacked on gluten-laden treats that looked just plain boring in comparison. Unlike many gluten-free cakes, this one will stay moist for days, even when eaten at room temperature. 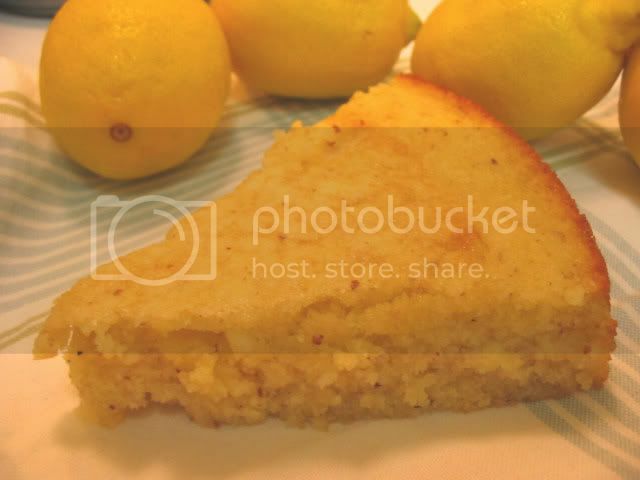 The delicate tastes of almond and lemon compliment each other beautifully. It is higher in protein and calcium than most baked goods, which is a great perk (though it obviously doesn't negate its sugary, buttery decadence). I use the Almond Meal/Flour from Bob's Red Mill, which can be bought at most health food stores or online. I recommend using Pamela's Ultimate Baking and Pancake Mix* like the recipe calls for, but you can use another gluten-free all-purpose flour mix as long as it contains xanthan or guar gum! Happy New Year to all! Let's raise a slice of cake to a 2007 full of health, joy, and peace. Preheat the oven to 350°F. Whisk eggs and sugar. Add almond meal and butter, and stir well. Pulse ricotta in blender or mash by hand, and then add to batter. Stir thoroughly to combine before folding in Pamela's Baking and Pancake Mix. Lastly, add the lemon zest, lemon juice and lemon extract and mix the batter to blend. Grease 8" round cake pan. Pour batter into the cake pan, and bake for 30 minutes. Cool for 10 minutes before slicing and serving warm. Dust with powdered sugar and/or garnish with fruit. 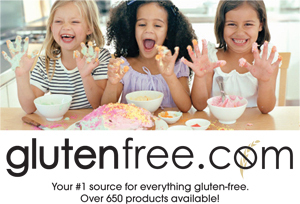 *Edited 3/09 to add: Pamela's baking mixes are under kosher supervision but are not certified by a mainstream kosher certifying agency, so most people who keep strictly kosher kitchens will want to use another gluten-free all-purpose flour mix. I no longer use Pamela's products in my house since I now have a more strictly kosher kitchen. If in doubt, check with your rabbi! You all must think I'm a vegetarian, given that I almost never post recipes for meat. But I do eat some (kosher) meat every now and then. I picked up a ribeye steak at Trader Joe's last week and pan-seared it using the technique that's become my hands-down favorite: Alton Brown's pan searing method. It turned out so perfectly-- tender and pink on the inside with a brown, spice-laden crust on the outside. The simple smoked paprika spice rub gave it a sweet, barbecued flavor. I sliced it and served it with steamed spinach and pureed cauliflower - Talk about an iron-rich meal! Try this recipe and let me know what you think - It's such an easy way to cook up a smoky, juicy ribeye steak without firing up the grill. Mix all spices and oil into a thick paste. Rub spice rub mixture onto both sides of the steak. Wrap with plastic wrap and allow to sit for 15 to 30 minutes at room temperature. Put a 10 to 12-inch cast iron skillet in the oven, and heat oven to 500 degrees. When the oven thermometer indicates that it has reached 500 degrees, remove the pan from the oven (do not turn oven off). Transfer quickly to a stovetop burner on high heat. Immediately place the steak in the middle of the pan. Cook for 30 seconds without moving. Flip with tongs and cook for 30 seconds on the second side. Quickly remove the pan from the heat and place into the oven. 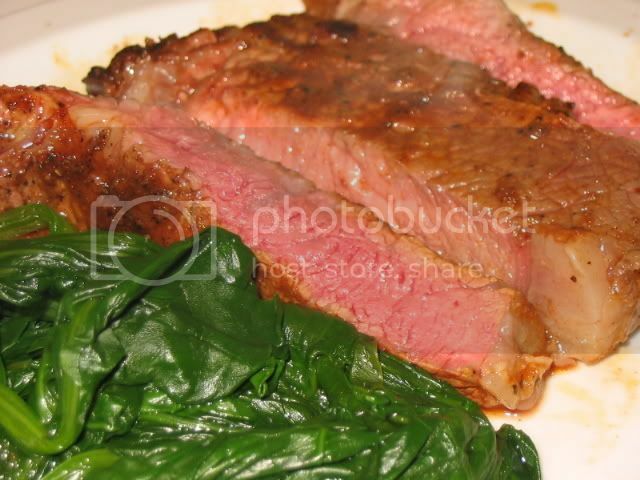 Cook for two minutes on each side for a medium rare steak, or three minutes on each side for a medium steak. Transfer steak to a wooden cutting board and make a loose tent of aluminum foil over it. Allow it to rest for a few minutes before serving. When I woke up to frost on the ground I knew it was really winter. And winter, of course, means soup season. This is an easy vegan lentil soup that is extremely flavorful. It is thick, almost like a stew. It has a spicy kick from the jalapeno, but feel free to leave that out for a milder soup. Try serving it with a dab of Cashew Sour Cream or dairy sour cream. Heat oil over medium-high flame in large pot. When the oil is heated, add onions and sautee until translucent. Add garlic and rosemary, and cook until they fragrance the oil (1-2 minutes). Add remaining ingredients, except for spinach. Bring to a boil, then cover and reduce heat to low. Simmer for 45 minutes, stirring occasionally. Add spinach and cook for 5 more minutes. Remove from heat. Adjust salt to taste. Allow to sit for 15 minutes before serving. I hope you're not tired of latkes already, because I have one more recipe for you. Don't worry, Chanukah's almost over and I'll move on to less greasy foods. I promise. This time, I combined the distinctive taste and wonderful crunch of celery root with the usual starchy Russet potatoes. I created this particular gluten-free latke recipe with the intent to freeze most of them, which is why it instructs you to make each latke into a well-packed patty to create a more cohesive pancake rather than loosely spreading the batter out to make a thin, lacy latke. I loved the flavor and the texture, and I ate a bunch of them for dinner, topped with applesauce. My freezer is now happily filled with many ziploc bags full of latkes. Preheat oven to 200 degrees or "warm" setting. Peel potatoes and submerge in cold water. Peel celery root with a paring knife. Pulse the onion and garlic in food processor. 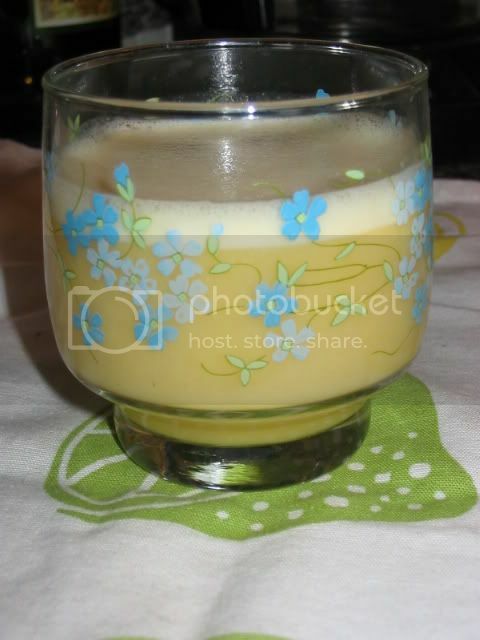 Mixture should be coarse, not completely pureed. Pour onion-garlic mixture into a large bowl. Grate the celery root using the larger grate of a box grater, or use the grater attachment of a food processor. Add to onion-garlic mixture and stir. Grate potatoes. Quickly squeeze a handful of grated potatoes at a time over a second bowl (or the kitchen sink) to remove all liquid. Add the dry potatoes to the onions and celery root, mixing as you go. This step should be done as quickly as possible to prevent oxidation of the potatoes. Heat 1/4 inch of olive oil in a large, heavy skillet (cast iron works best) over medium-high heat, until just below the smoking point. Add remaining ingredients to the batter, and stir until fully combined. Place a small handful of batter (approximately 1/4 cup) in the hot oil at a time. Pat each handful into a 1/2" thick pancake shape before placing in oil - This will help each latke stay together. Fry until completely golden-brown on the bottom and crispy around the outside corners. Flip and brown on the second side. Transfer latkes to a plate lined with paper towels or several layers of brown paper (I use grocery bags). Allow paper to absorb excess oil, then transfer latkes to a cooking rack placed over baking sheet in the preheated oven, where they will stay warm until ready to serve. Serve hot, with sour cream and applesauce. 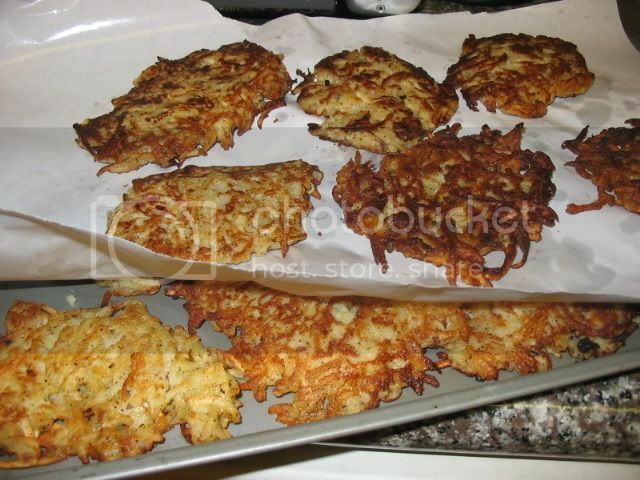 Extra latkes can be frozen on a baking sheet in the freezer, with parchment paper or freezer paper between the layers. When frozen, transfer to ziploc bags. Reheat in oven at 400 degrees F.
Roasting at a high heat caramelizes the edges of the brussels sprouts, and the flavor is emphasized by a simple combination of spices. This recipe just might make even a brussels sprout hater change their mind. Preheat oven to 400 degrees F. Cut the bottom of each brussel sprout off (about 1/4" or less) and then slice in half lengthwise. Toss all ingredients and place in a single layer on a baking dish. 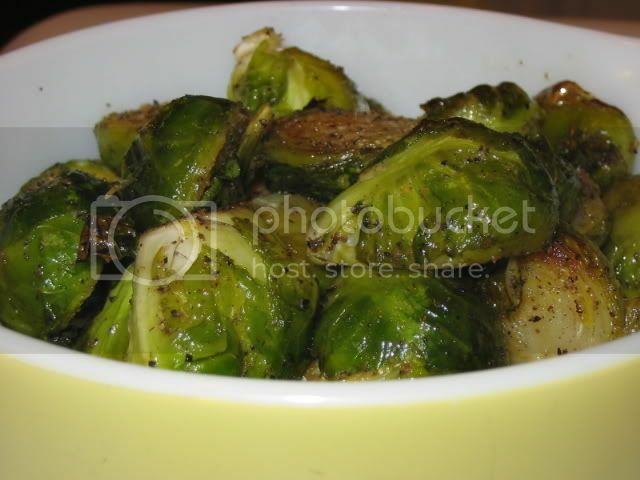 Roast for 25 minutes or until brussel sprouts are slightly browned and tender throughout. Toss once, half-way through cooking. Serve hot or cold. This week's best gluten-free recipes from all over the food blogosphere. Both of these applesauces go beautifully with potato latkes, or eat them by the spoonful like I do. Depending on what varieties of apple you use, your sauce can range from extremely sweet to very tart. I recommend using half sweet apples (I chose Braeburn) and half tart apples (Granny Smiths are perfect). This recipe has no sugar added, which lets the fruit shine on its own. Cut apples into approximately 1 inch cubes. Add all ingredients to pot, and turn heat on high. Bring to a boil, then cover and reduce heat to low. Simmer for 20-25 minutes or until the apples have softened significantly. Stir frequently, making sure that the apples are not sticking to the bottom of the pot. Add more liquid if necessary. Remove lemon slices. Mash with a potato masher or use a food mill for a smoother consistency. Serve warm or at room temperature. Cut apples into approximately 1 inch cubes. Add ingredients to pot, and turn heat on high. Bring to a boil, then cover and reduce heat to low. Simmer for 20-25 minutes or until the apples have softened significantly. Stir frequently, making sure that the apples are not sticking to the bottom of the pot. Add more liquid if necessary. Remove lemon slices. Mash with a potato masher or use a food mill for a smoother consistency. Serve warm or at room temperature. This recipe is part of the Antioxidant Rich Foods / 5-A-Day recipe roundup. Ah yes, the obligatory latke post. 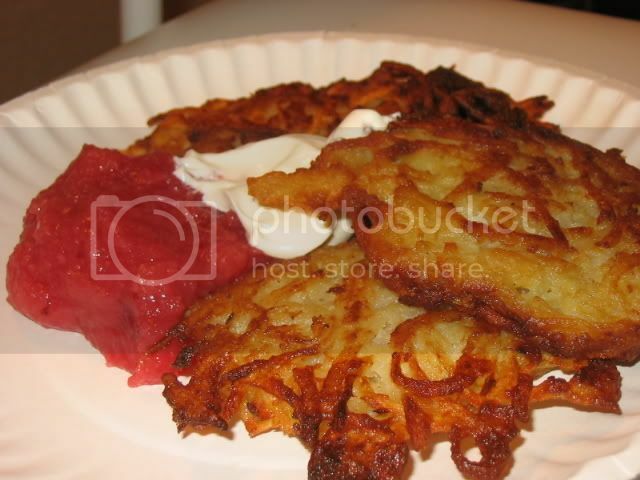 This is more or less my family potato latke recipe, but made with a gluten-free flour mix instead of matzo meal. The rice flour mix works wonderfully. We gobbled them up so fast last night that by the time my friend Poet With a Day Job reminded me to take photographs there were only three sad, cold latkes left. I was in such a food coma I slapped them on a paper plate, gussied them up with some sour cream and cranberry applesauce, and took a lazy, crappy photograph. Sorry folks, you're just going to have to take my word for it that these puppies are some top of the line latke specimens. It made my day yesterday to be able to hook two other gluten-free friends up with latkes and sufganiyot. Chanukah is so much more full of naches* when you don't have to worry about getting glutened. Peel potatoes and submerge in cold water. Grate the onion into a large bowl. Grate the potatoes using the larger grate of a box grater, or use the grater attachment of a food processor. Quickly squeeze a handful of grated potatoes at a time over a second bowl (or the kitchen sink) to remove all liquid. Add the dry potatoes to the onions and mix as you go. This step should be done as quickly as possible to prevent oxidation of the potatoes. Add remaining ingredients to the batter, and stir until fully combined. Place a small handful of batter (approximately 1/4 cup) in the hot oil at a time, gently pressing each latke with the back of the spatula so that it is no more than 1/3" thick. Do not press too hard, as the latkes will be more crispy if the the batter is not densely packed and each latke is thin and lacy (space in between the pieces of potato). 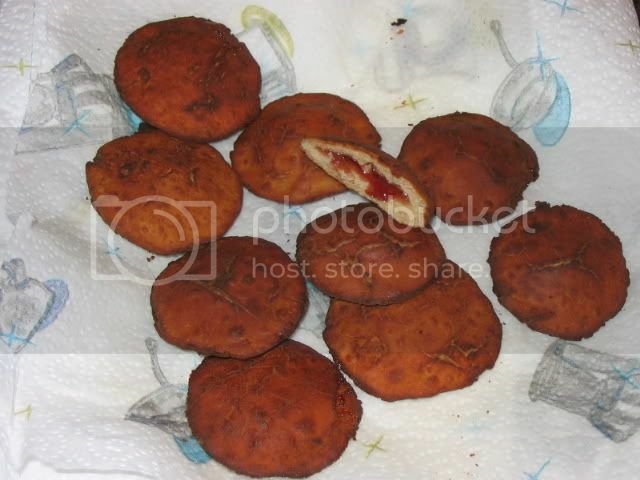 Fry until completely golden-brown on the bottom and crispy around the outside corners. Flip and brown on the second side. Transfer latkes to a plate lined with paper towels or several layers of brown paper (I use grocery bags). Allow paper to absorb excess oil, then transfer latkes to a cooling rack placed over a baking sheet in the preheated oven, where they will stay warm until ready to serve. Serve hot, with sour cream and applesauce. A slight variation on the cake flour mix that I usually use, which I'll be referring to in some upcoming recipes. This gluten-free flour mix doesn't have xanthan or guar gum in the ingredients - Add the gums as necessary in baking recipes. Generally 1/2 teaspoon of xanthan or guar gum should be added for cakes and pastries, 1 teaspoon per cup for breads or pizza. Cookies can vary between no xanthan gum and 1/2 teaspoon per cup of flour. Works well for most baked goods and other recipes. Not fine enough for use as a gravy thickener or for very delicate pastries. Has a fairly light consistency. Enough about KitchenAid mixers. Let's talk about something that really matters. Imagine that in your neighborhood there are liquor stores on every corner, but no grocery store or produce market anywhere around. You have your choice of candy, chips, liquor and cigarettes but the freshest food at these corner stores might be a withered lemon or, if you're lucky, a wilting bunch of overpriced lettuce. You might have a medical condition like celiac disease, heart disease, lactose intolerance or diabetes, but the food you need to control your condition is simply not available. Picture that you are low-income, you don't necessarily have a car and may not have the option to leave your neighborhood on a regular basis. You may be on food stamps. Stores that sell healthy food are in another part of town, and have prices that are out of the range of affordability. Imagine that like most Americans you worry about your health but were not taught nutrition in school in any meaningful way. You might be eating a lot of fast food because it's cheap and available. You know that eating healthily could improve your quality of life and your health, but you don't have the resources to do so. On top of these food access issues, your community is struggling with disproportionately high unemployment rates and limited access to medical and social services. People assume the high murder rate in your neighborhood is the biggest risk faced by residents, but in fact heart disease is the number one killer. What you just envisioned is the reality for many people in West Oakland, CA, and residents of low-income urban communities across the country. Now imagine that folks in your neighborhood start a non-profit organization that works with residents to help empower the community to meet its own nutritional needs. Not an outside organization that comes in to distribute food, but a community-based organization that helps people learn how to grow their own food through urban farms and gardens, that teaches culturally relevant nutrition and healthy cooking classes to people of all ages. The organization goes into schools to teach nutrition to kids. They start a "mobile market" that drives around areas of your community selling local produce and healthy groceries. This organization is not about "charity", it's about creating a self-reliant, socially just and sustainable food system in your neighborhood. Imagine that they start selling healthy, organic produce and snacks to kids at public schools and YMCA afterschool programs. Picture a program that trains and employs young people from the community as nutrition educators, entrepreneurs and farmers. The organic produce harvested from the 5 urban gardens and a local farm get sold to neighborhood residents at rock-bottom prices, and what is left gets purchased by local restaurants and individual consumers. The focus is on local, sustainable agriculture and the health and economic empowerment of low-income people. What you've just imagined is not just a dream, it's become reality... The organization is People's Grocery. People's Grocery started in 2002 and with a tiny little budget has been making a huge impact on many peoples' lives with a number of successful food security projects. It is becoming a model for organizations all across the country. Now it is time to realize their ultimate goal, of creating a full-service, community-run, cooperative grocery store... The first of its kind in West Oakland. They envision a grocery store where all the produce is local, much of it sourced from urban farms. There will be culturally-competent nutrition educators on staff, and a cooking school located at the facility. They will give double the face value of food stamps when they are used to purchase fresh produce. A sophisticated business plan is in its final stages, incorporating community involvement at all levels of the enterprise and focusing on health and empowerment. This is a major new step for food security for the people of West Oakland as well as the rest of the city. Gift guides are popping up all over the blogosphere, so let's talk about some gifts ideas for people with food intolerances. I'll share with you my own holiday wishlist, as well as some other ideas for food intolerant people in your life. Some of these links are affiliate links, which means that if you do purchase something by clicking over from my site, you will be helping to maintain and expand this site at no cost to you. I hope these ideas are helpful to someone out there who's looking for a way to support a friend or family member with celiac disease or food allergies during this holiday season. 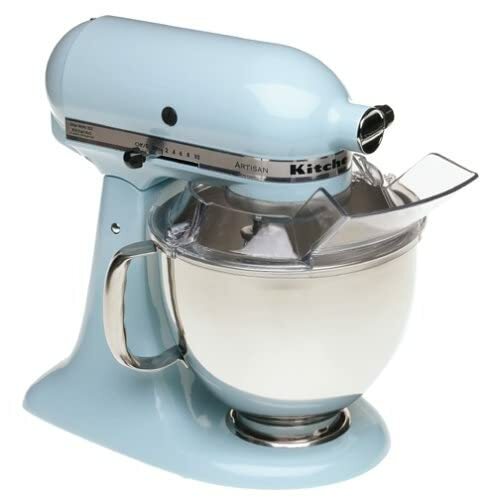 What's missing most from my kitchen is a Factory-Reconditioned KitchenAid RRK150WH Artisan Series 5-Quart Mixer (preferably in Glacier Blue, but beggars can't be choosers). Because of health issues it is painful for me to stir, knead, etc and my muscles fatigue easily. This would open the door to much more bread-baking and other culinary endeavors that are just too much work right now. 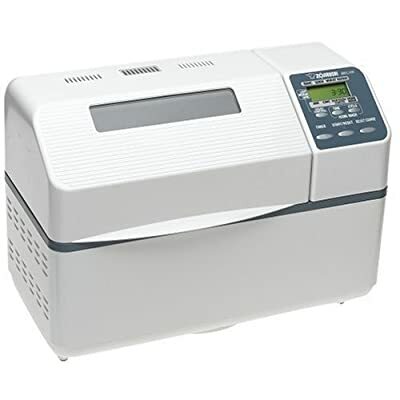 The most highly acclaimed bread machine for gluten-free bakers is the Zojirushi BBCCX20 Home Bakery Supreme Bread Machine . Every post about bread machines on the gluten-free bulletin boards I read sings its praises. Other models entice buyers with a gluten-free cycle, but this seems to be the one that actually delivers. I'd end up saving quite a bit of money by baking my own bread rather than buying all that overpriced, disappointing packaged gluten-free bread at the store. Let's be honest, I don't need both a bread machine and a mixer. A mixer would probably do the job just fine. But hey, when I have the kitchen of my dreams there will be room for endless kitchen appliances! Yes, I pride myself on making my own flour mixes from scratch. But there are times when convenience is everything, and this mix really does the job, with no added sugar or other unnecessary ingredients. But enough about me... Let's talk about some other gifts that will make your loved one/s smile! For someone who has recently discovered that they have to avoid gluten for the rest of their lives, the book Living Gluten-Free For Dummies by Danna Korn is a thorough guide to understanding what you can and can't eat, how to cope, and how to navigate grocery stores and restaurants. Food shopping is stressful for people with celiac disease. 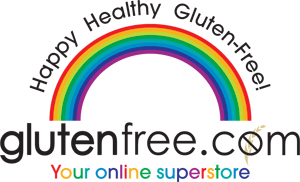 You can take the stress out of it with a subscription to the frequently updated downloadable Gluten-Free Food & Drug Product Lists. They can be downloaded to a Pocket PC, laptop or desktop computer, or Palm Pilot for easy reference while at the grocery store - Some come with subscriptions that allow you to update the list on a regular basis. This is a great way to keep a loved one safe and healthy. 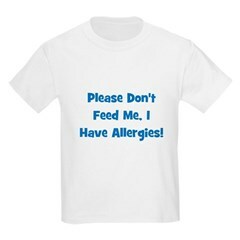 If there's a little one in your life who's too young to advocate for their own dietary needs, how about a child's allergy awareness t-shirt or bib? And for the grown-ups, Karina the Gluten-Free Goddess has a line of very cute and stylish t-shirts at her shop Mucho Gusto that feature colorful graphics and messages. Last, but not least, tasty treats make a great gift! There are gluten-free cookie gift baskets , and even a special gluten-free gift-basket just for kids. Forgive me for not having the energy to write about each recipe this week. A simple list will have to do. All of these recipes are gluten-free and look fantastic. Bon appetit! Last night I really needed some comfort food. There must be something about potatoes that sets off a chemical comfort explosion in my brain, because I knew immediately that's what I wanted. 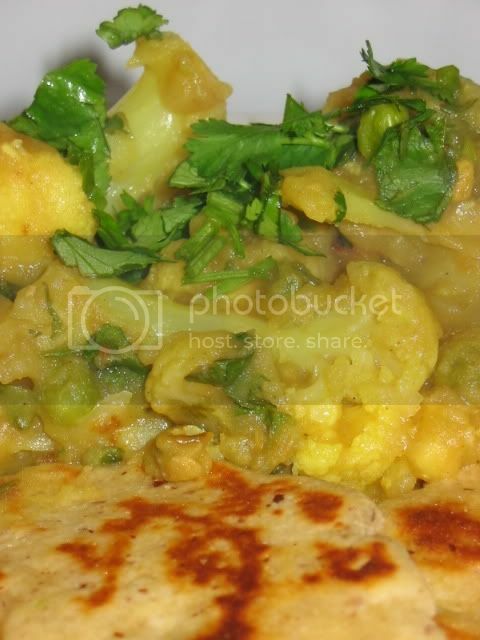 So I cooked up one of my favorites - Aloo gobi mattar, an Indian curry with potatoes, cauliflower and peas in a rich blend of spices. My recipe is a slightly more "saucy" adaptation of aloo gobi, which traditionally tends to be a dry curry. I generally make this as a vegetarian dairy dish, using ghee and vegetable broth (I keep gluten-free bouillon cubes on hand). While you can make this dish vegan/pareve by using olive oil, ghee dramatically enhances the flavor. Serve this dish over basmati rice with naan or chapati. 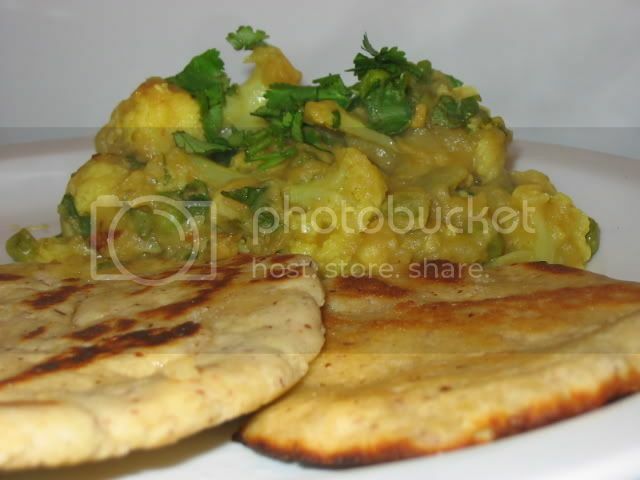 The flatbreads pictured were my second attempt at making gluten-free chapati. After my initial failure I threw together a slighly more palatable version which I spread some tamarind sauce on before using them to scoop up the curry. The recipe is not good enough to share with you all yet, but I'll post it when I've tweaked it a bit. Heat oil in a large wok, karahi, or deep nonstick pan over high heat. Add onions and cumin seeds, and cook until onions are translucent. Then add the minced garlic, chunks of ginger and chili pepper. Sautee for 2 minutes, stirring frequently. Add all remaining spices, including salt. Stir well. Immediately add potato to pan. Stir until coated in oil and spices. Turn heat down to medium and sautee potato for 3-5 minutes, stirring frequently. Add chicken or vegetable stock, then put lid on pan, lower heat to medium-low and simmer for around 15 minutes. Add the cauliflower florets, grated ginger and lemon juice. Stir well. Replace lid, turn heat to low, and let simmer for about 10 minutes. If the ingredients are sticking to the pan, you can add a bit more stock or 1/4 cup of water at this point. Add frozen peas to pan, and stir ingredients. Cover and simmer for 10 more minutes. Turn off heat. Add half of the fresh cilantro, and mix thoroughly. Replace the lid, then allow to rest for 10 minutes before adjusting salt to taste and serving dish over rice. Garnish with remaining fresh cilantro. Makes about 6 generous servings. on top of a cauliflower stalk... Careful, don't fall! Following GlutenFreeGirl's brave lead, I want to share with you that I do make dishes that end up in the trash. Dishes that are too ugly and embarassing to photograph. Dishes that are so inedible there is no creative way to salvage them. I've made two such "losers" in the past week, in fact... Which is an all-time record. NASTY! Not just ugly, but so awful that they ended up in the garbage (and you all know GF flours aren't cheap! What a waste.) Just be glad I didn't post a picture of the incinerated "donut holes" which were a dense, inedible ball of uncooked, unrisen dough with a fully incinerated black crust. It might have made you cry. Oh, but that wasn't enough of a cooking disaster for the week. 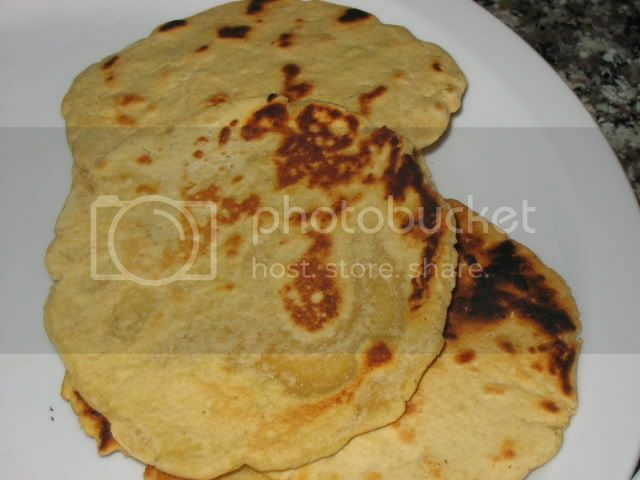 No, we also had the "Gluten-Free Chapati" experiment. GROSS! This was a chickpea flour-based recipe. Now, I'm no fan of chickpea flour generally speaking, but it's hard to imagine how an ingredient that makes something as thoroughly tasty as the socca could also make something as utterly disgusting and inedible as this horrible attempt at the Indian flatbread I used to cook frequently when I could eat wheat. Don't be deceived by the picture - These babies were horrendous and I threw them straight in the garbage. I'll try a slightly more hopeful-looking gluten-free naan recipe soon and we'll see how it turns out. I comforted myself after my latest culinary failture by cooking up a tried and true curry for dinner (recipe forthcoming), and settling in with a CSI rerun. 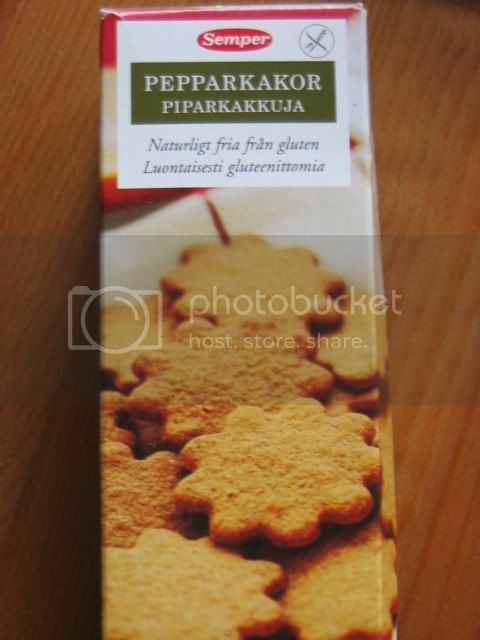 A box of gluten-free pepparkakor - Swedish ginger snaps! They are incredibly crisp and full of flavor. I don't speak Swedish but I got the sense from the ingredient list they were made of rice flour and potato flour, but mostly just a whole lot of sugar and margarine. So tasty! 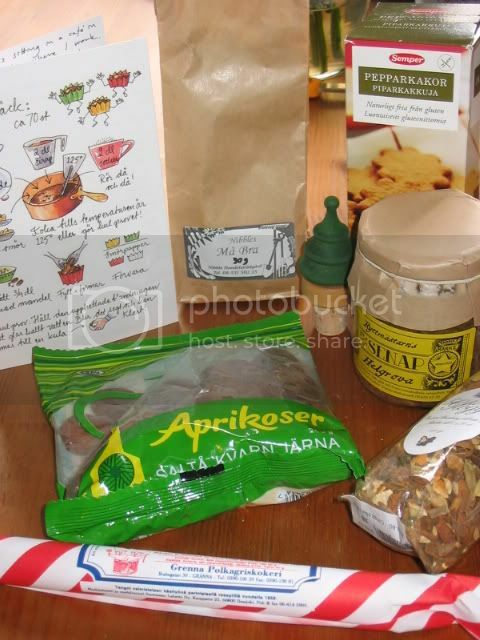 Spice mix for making glogg (Swedish mulled wine), as well as Kristina's recipe for making it, and instructions on how to make an alcohol-free version. Loose herbal tea, the ingredients of which I haven't figured out yet - They are listed as Vinbarsblad, Citronmeliss and Abrodd. Anyone know Swedish? I have to admit I worried that whoever I was matched with wouldn't understand the "gluten free" thing and would send me lots of things I can't eat. It was such a treat to get a package full of things I can eat. Thank you, Kristina! The package was the highlight of my day, and I can't wait to taste everything. It will be a miracle if the pepparkakor last more than 24 hours! 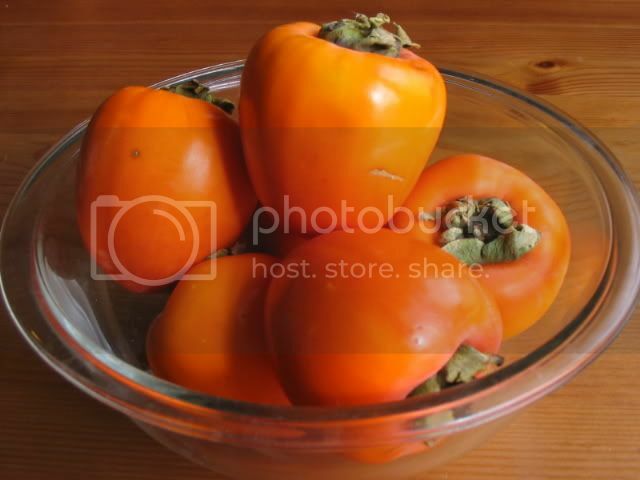 Once upon a time, the blogger known as "By The Bay" purchased two pounds of Hachiya persimmons at Oakland's Grand Lake Farmers' Market. 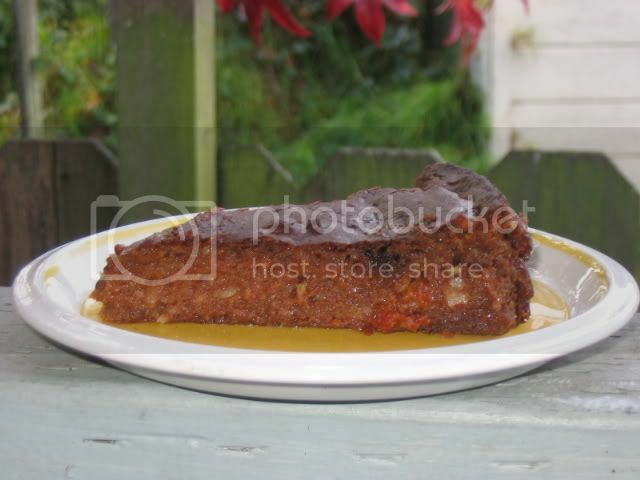 She wasn't a big fan of persimmons, but something about Elise's Persimmon Pudding Cake recipe called to her. She bought them firm and unripe, but knew that in order to be edible this variety of persimmon needed to be so ripe and mushy that they would practically fall apart in her hands. She figured they would be ripe enough in a week's time. A week passed, and they were still hard as rocks. She knew she could do things to help ripen them, but decided instead to wait and see how long it would take for them to do so on their own. Another week passed, and still they weren't ripe. Thanksgiving came around and she left town, thinking for sure when she got back they'd be ready to use. No such luck. But a full month later, she came home from work and knew today was the day... The persimmons were finally ripe! So she set about adapting Elise's recipe to be gluten-free, changing the recipe just enough to make it her own. 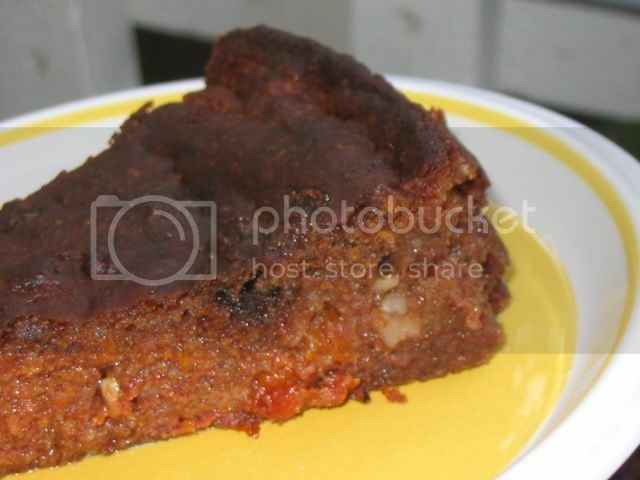 The result was a rich, sweet cake with a moist consistency akin to bread pudding. The distinctive flavor of the persimmons came through beautifully, and the taste of pecans and caramelized sugar rounded out the flavor. Preheat oven to 400 F. Grease a 8" round cake pan. In a large bowl, mix persimmon pulp, eggs, butter, buttermilk and vanilla. In a separate bowl, mix flour, sugar, baking powder, baking soda, salt and spices. Slowly fold the dry ingredients to the wet ingredients. Mix until thoroughly combined. Add chopped nuts and stir to incorporate. Pour into cake pan and bake for about 50 minutes. When done, the center will still be very moist and soft, but the outside of the cake should have formed a firm crust and be well-browned. Remove from oven and allow to cool in the pan for at least 20 minutes before serving. Slice and serve warm. For a one pot meal, try this quick version of Chicken Pelau, one of Trinidad's signature dishes. Elise's Eggplant Lentil Stew with Pomegranate Molasses looks divine. Use gluten-free bread crumbs and Worcestershire sauce to create Artichokes Dunbar, a kosher and vegetarian dish inspired by Creole favorite Oysters Dunbar. It's soup season, and Spicy Sweet Potato & Carrot Soup looks creamy and flavorful. This beautiful recipe for Eggplant Stuffed with Carrots, Garlic, and Herbs can conveniently be prepared the day before you plan to serve it. Crushed White Bean Spread with White Truffle Oil looks like it would be terrific slathered on toasted gluten-free bread, crackers, or raw vegetables. Brendon takes biscotti to new frontiers with his recipe for savory Black Pepper & Parmesan Biscotti. Shaheen shares with us her recipe for Kalthappam / Rice Cake with Jaggery, which she suggests for breakfast. Serve up some Lentil and Artichoke Soup, another simple yet sophisticated recipe from the kitchen of Ilva. For the eggless among us, Susan's Mini Crustless Tofu Quiches are sure to please. It's summer in December with Shannon's Blackberry Upside-Down Cake. Who said salads have to be served cold? Warm Spiced Pumpkin and Lentil Salad with Pears, Almonds and Goat Cheese is both colorful and seasonal. Avocado and Bean Salad with Tomatoes and Fried Quinoa introduces different way to prepare quinoa, one of the most nutritious GF grains around. Mona bakes a Gluten-Free Holiday Coffee Cake. My own recipe highlights this week include Roasted Butternut Squash, Marcona Almond and Pomegranate Salad and nouveau Chanukah treat Chocolate Dipped Apricots (Apricot Gelt). As part of a meal I cooked for my mother, who's visiting from New York, I put together this sald. I based it around some ingredients I had on hand - roasted butternut squash, a ripe pomegranate, and Marcona almonds-- the sweet, heart-shaped Spanish variety of almond that is fried lightly in olive oil and sea salt. I bought the almonds at Piedmont Grocery, but discovered today that you can find them in tins at a very reasonable price at Costco. This salad was a side dish for grilled chicken breasts but cended up as the star of the meal, with the meat nothing but a footnote. Since it was a meat-based meal, for reasons of kashrut I didn't add goat cheese - But if you're not kosher, or are not eating it with meat, I think goat cheese (soft or feta, crumbled) would be a perfect touch. This was one of my favorite salads, with perfectly complementary textures and flavors along with vivid fall colors. Combine vinegar, olive oil, honey, mustard and black pepper in a jar. Shake thoroughly to combine. Add just enough dressing to the salad greens to coat the leaves very lightly. Add squash and pomegranate seeds. Toss gently. Sprinkle marcona almonds and goat cheese (optional) on salad just before serving. Makes 3-4 servings. Note: A tutorial for removing the seeds of a pomegranate can be found here. This recipe is part of the upcoming Fall Salads Event at My Life As a Reluctant Housewife. Preheat oven to 375. 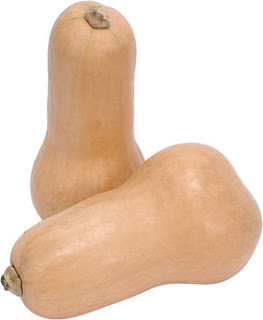 Cut ends off butternut squash, peel, and slice lengthwise. Remove seeds and chop into 1 inch cubes. In a medium bowl, combine spices, oil and vinegar into a paste. Add squash and toss until coated. Arrange the squash cubes in one layer in a roasting pan. Roast for 20 minutes, toss once, and cook for an additional 25 minutes or until the squash is browned and is tender throughout. Serve warm as a side dish, or chill and use in a salad.